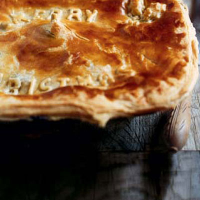 "We hold with the tradition that savoury pies are decorated and sweet ones not. I like to top ours with leaves - holly leaves at this time of year, and a Christmas message - but you can use any shapes you like." Toss the game meat and venison in seasoned flour. Melt the dripping in a large, ovenproof casserole, then add the floured meat and brown on all sides. Remove from the pan and set aside. Add the onions, garlic and lardons; sauté until lightly coloured. Add the mushrooms, drained wild mushrooms (reserve their soaking water) and chestnuts; sauté for a further 5 minutes. Add the stock, wine, water from the wild mushrooms, bouquet garni, redcurrant jelly and meat. Bring to a simmer, cover and cook gently for about 1 hour until the meat is tender. Allow to cool, and chill for 24 hours. Preheat the oven to 220°C/gas 7. Transfer the meat mixture to a deep, 30cm x 20cm pie dish. Place a pie funnel in the centre. Roll out the pastry to the thickness of a £1 coin - about 3mm. Brush the top lip of the pie dish with water and press on a 2cm strip of pastry. Brush with water, then lift the rolled pastry and lay it carefully over the pie dish. Press the edges to seal, make a hole in the centre around the pie funnel and trim the excess. Brush the surface with the egg wash. Cut out some decorative shapes from the pastry trimmings; arrange these on the surface, then glaze them. Put the pie in the oven and bake for 40-45 minutes until the pastry is golden and the pie is cooked through.